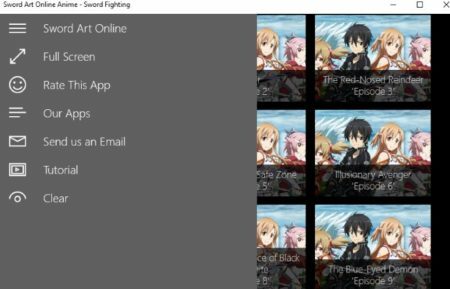 This article covers 6 Windows 10 apps to watch anime online easily. There is a quite a big fan following of these anime all over the world. People love watching anime cartoons. Hence when you search for anime on the Windows 10 store, you will find lot of apps which let you watch anime online for free. So in this article we are covering anime apps which let you watch anime cartoons for free. Anime is basically a Japanese form of animation or animated cartoon. These animated cartoons are made for adults as well as kids. They have a particular animation style and mostly all the anime comes from Japan. But these anime have become so popular that a lot of people watch it all over the world. 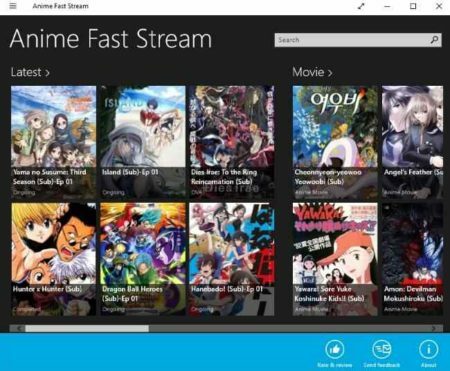 Let’s look at some 6 Windows 10 apps to watch anime free below. 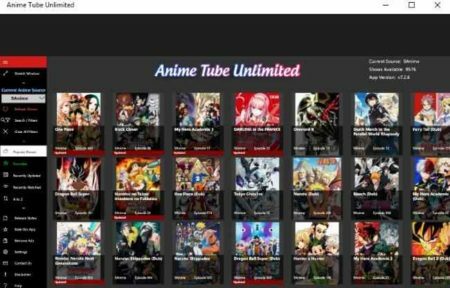 Anime Tube Unlimited is a nice app for watching anime online free. In this app you will come across an interface like the one given above when you open the app. You can see all the anime available in the app listed in form of tiles on the home page. The menu options can be seen in the left side. The total number of anime in the app and app version can be seen on the top right side. You can choose any anime and start watching it. In case you are looking for a particular one, then you can easily search for it using the search and filters option. You can also add anime which you loved to your favorites section. That way you don’t have to search for them again. 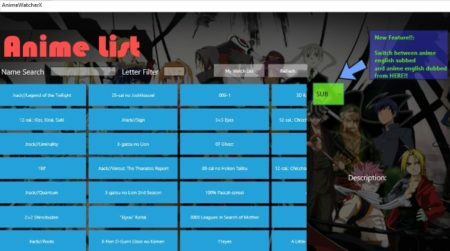 You can also sort the anime list in alphabetical order for easy navigation. The source from which these anime are streamed can be changed as well. Changing anime source might offer you new anime or sometimes even better quality anime. When you are ready to watch an anime, just click on its tile and a small window will open with a summary about the anime. Just click there and it will start playing in the app window itself. Sword Art Online Anime is a nice app to watch anime. This app is focused on sword fighting anime. The app interface is pretty basic as can be seen in the above screenshot. The anime are all listed on the homepage of the app in tile format. You can click on any tile to start playing the anime video. The only annoying thing on the video player screen is the ads. There are lots of ads which pop up around the video player. This does affect you as the ads are distracting. The left side of the app has menu options like make the app full screen, rate the app, pin to start, tutorial, etc. The app features over 20 anime which you can easily play, pause, rewind, or forward. Dragon Ball Super Kids Anime is a free app to watch Dragon Ball cartoon series. As you can see in the screenshot above this is the homepage of the app where all the episodes of this anime are listed in tiles format. You can select any episode that you would like to watch. As soon as you select a episode, it will open up in the video player and start playing. The app has its own video player, so the video is played inside the app. You can make the app full screen for a better view. But the only drawback is that the video player window has lots of ads on it. So if you don’t have a problem with ads, then you can give it a try. You can check out a detailed review of this app here. Anime Fast Stream is a nice app to watch anime online. The good features of this app are its video player, the anime are sorted into categories, and you can stream episodes of ongoing series. The interface of the app can be seen in the screenshot above. The anime in this app are listed in a sorted manner. The anime are divided into categories like latest, ongoing, anime movies, English Sub, and English Dub. You can easily browse through these categories. To play an anime click on its tile. A window will open up with a small summary of the video. Also a pop up will show up saying that the episode will be marked as watched once you have started playing it. Go ahead and play the anime. Now the video player will open up in the app window and the anime will start playing. The video quality and clarity are great. Some video also have English subtitles in them. Crunchyroll is a nice anime app to watch anime free. In this app also the anime available are listed on the home page of the app in tile format or list view. You can choose which ones you want to watch. 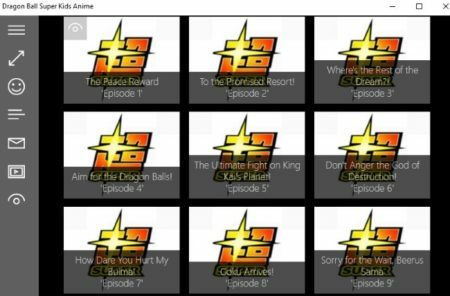 The screenshot above shows all the episodes of a particular anime chosen. You can easily play any episode by clicking on it. The video will be played in the app window. You will also get a pop up for trying out the premium version for free for 15 days. You can do that if you want to or you can even continue with the free version of the app. In the free version you will have to put up with some ads, in case you do not want that than you can go for the paid version of the app. You can check out a detailed review of the app here. AnimeWatcherX is also a nice app to watch anime online. 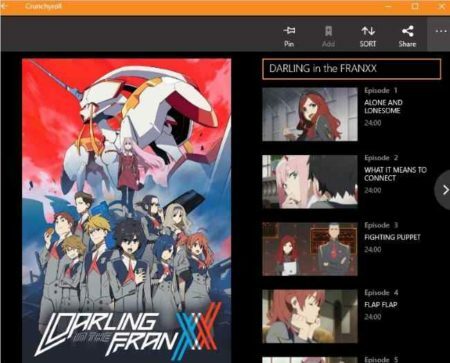 The interface of the app can be seen in the screenshot above where all the anime are listed with there names. You can browse through them or search for a particular one. Clicking on a anime name will open up a picture and description on the same page towards bottom right of the page. Below the description is a watch button which will play the anime in the video player. If the video takes too long a time to load then you can click on the button given at the bottom which says “try another source”. The app is good for watching lots of good anime. The only drawback is its interface, which I found confusing. Its not very user friendly. You can check out the review of this app here. These are some of the anime apps which you can download to watch anime online for free. All these apps do a good job at it. While some might show you ads on the video playing screen, but that is one of the cons which comes with free versions of apps. But if you want great video quality then definitely go with Anime Fast Stream. Check the apps out and see which ones you like.